On May 20 the planetary power began to make a major shift from the lower to the upper half of the Horoscope, the sector of outer activities. Home and family are still important, but you can start shifting your attention to the career and the outer goals. It is daytime in your year, and time to be about the affairs of the day. Basically this is a good and successful month. Finances continue to soar, personally and for the beloved. Saturn, your financial planet, which has been retrograde for many months, starts moving forward on the 8th. Thus there is clarity in financial matters and major moves, purchases or investments will go better. The family as a whole (and espe­cially a parent or parent figure) is also prospering now. You are catching the lucky breaks in financial matters. Things that you already own increase in value. Something that you thought was worthless turns out to be valuable. 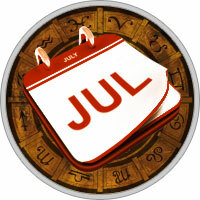 Specu­lations are favourable, after the 8th; the 19th to the 24th seems especially favourable. Health is also much better now, and after the 22nd it gets even better. If there have been health problems you hear good news after the 22nd. You can enhance your health further by giving attention to the heart until the 23rd. Avoid worry and anxiety. Take positive steps to improve your situ­ation and reduce stress. After the 23rd give more attention to the small intestine. Right diet will be a help. Love is not that important this month, though it is a sexu­ally active kind of month, so you are not idle in that depart­ment. Social goals seem to have been attained, so there is no need for dramatic actions or changes. Your love planet is retrograde until the 20th, so the beloved seems to lack a sense of direction these days. Mercury also makes a square to Uranus from the 17th to the 26th which will test your present love. Your spouse, partner or current love will be more temperamental, so exercise more patience - no need to make matters worse than they need to be. He or she needs to be more careful driving, and to avoid risky situations. Foreign travel is not advisable that period. This transit also seems to bring career changes and shake-ups. Ultimately these will prove beneficial for you. Venus crosses your Mid-heaven on the 23rd - basically a good aspect. It brings career opportunity to you. Friends are succeeding personally and are helpful in your career. Your good work ethic is noted by superiors. On June 21 the Water element once again became unusu­ally strong. You experienced this in February and March as well. People are hypersensitive these days. Bluntness and honesty is likely to be seen as insensitive - so watch what you say.